I embarked on the Flodden journey several years ago with a Primary 7 class of mixed ability pupils. This was a completely new topic for me as I had never taught it before. As a teacher who has always adopted a proactive approach to active learning I was delighted to find that a Flodden project, to commemorate the 500 year anniversary, had been set up with an outreach education officer. learning outdoors, field trips, visits and input by external contributors. The whole Flodden experience enabled the children to contribute to and help form their own learning. Through the workshops they were able to interact with adults and their peers which helped them construct their knowledge and make connections with other areas of knowledge they had. The workshops were perfectly pitched to allow the children opportunities to be involved in role play and activities which engaged them and supported and prompted learning. The children are used to being in an environment where they are encouraged to be actively engaged with their learning. 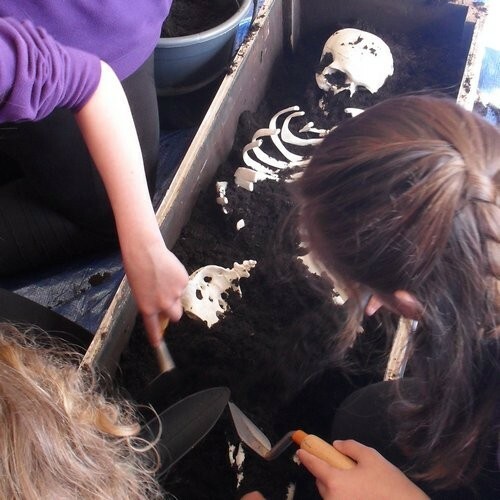 The simulated archaeological dig not only fulfilled this but gave them a chance to use their enquiring mind where they were actively encouraged to think “outside the box,” looking for clues and making connections. This gave them the chance to become engaged and challenged in their thinking, using both real life and imaginary situations. A wide range of resources was available from costumes where they immersed themselves in role play to artefacts where they posed themselves questions. The introduction of the Alnwick muster roll made them work collaboratively and use all their language based skills asking searching questions and making connections with the real people who had been involved in the battle. The learning opportunities were appropriately paced and challenging, meeting needs of all the individuals. It was a delight to see all the children learning within the rich environment created. The children tackled problems rather than achieved a specific outcome. This was clear when they were given the chance to act out the Battle, thinking of the size of the armies and the strategic placing and vantage points of the men. This activity was open and gave the children the chance to predict requiring sensitivity as the learning emerged and evolved. I feel one of the reasons the Flodden project was so successful was that it totally embraced the way children learn. The content was perfectly tailored to both year groups I have been involved with. The visits from the different age groups had quite different outcomes. The Primary 7 children were given the opportunity to develop their archaeological skills further by being invited on the Big Dig where they learnt more about how to understand an area/period of history/how people lived through working on a site with skilled professional people. The Big Dig, at Ford Moss, prompted the children to question the fact that the people didn’t think about the impact of what they were doing, by building the mines and how this would impact on future generations. They marvelled at the simplicity of the life the people had led and at the hardship, comparing it to their own. So heading away from the children’s familiar environment provided them with new perspectives and lead to insightful conversations and discoveries about how the actions they make in the future will or could have consequences. This linked to the idea of sustainable learning, the children discussed the ways people lived in the past and that they weren’t always fair and equal. Using the different castles helped the children immerse themselves into role play. They enjoyed the freedom of being allowed to explore but at the same time be challenged to think about the different roles people would have had in the castle. Using the Museum in Berwick gave the children the opportunity to surround themselves with artefacts and marvel. Our experience throughout the project has certainly created a lasting legacy amongst the children and one that will go with them on their journey.